Craving more adrenaline-pumping excitement than a hammock on the beach? 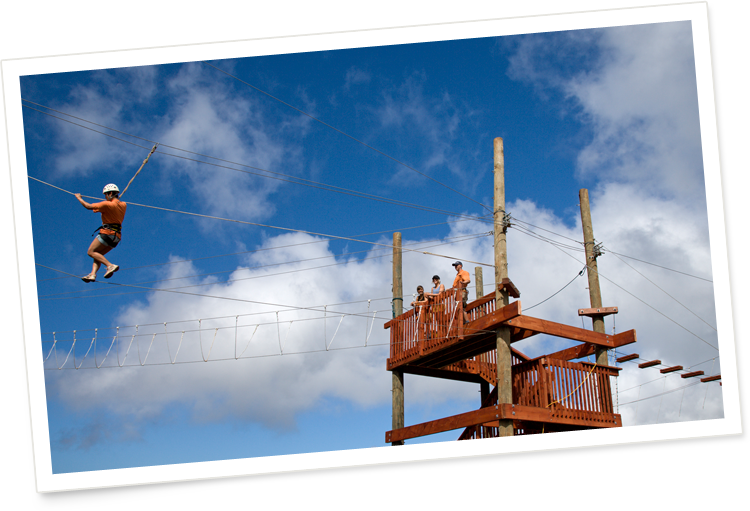 Kapalua Ziplines offers guests the ability to “fly” across gulches on the West Maui Mountains. With nearly two miles of parallel zipping, Kapalua’s zipline course is one of the country’s largest. Closed toe hiking or athletic type footwear is required. No Crocs allowed. Be advised that the weather can change quickly so layered clothing is a good idea. Remove hanging or dangling jewelry and rings before attempting the climbing tower. Kapalua Ziplines is not responsible for the loss of personal items such as cameras and sunglasses. Patagonia rain jackets will be provided at the beginning of experience. Many people are nervous about heights (despite what they say!) and we understand that some people may be apprehensive about tackling an experience such as this. However, our Tour is designed to gradually prepare you for some of the higher, longer zip lines. Our professionally trained guides will be with you at all times to make sure that everyone has a positive experience. All our equipment is checked daily and meets or exceeds all industry standards.